The black rhino is the smallest of the African breeds. It is critically endangered, with very few left in the wild, and a dwindling population in captivity. Like many other rhino species, human poachers have decimated these creatures to a mere fraction of the original population. The western subspecies of black rhino was declared officially extinct in 2011. There were once as many as eight subspecies of black rhino, but only five of those still exist today. The black rhino is another sad example of how humanity has negatively affected a beautiful ecosystem. Black rhino males weigh about 1,500 – 2,500 kilograms, females about nine hundred kilograms. While their name implies different coloration, the black rhino is actually a gray or brown. Their skin coloration is largely based on the soil types near where the rhinos wallow in the mud. 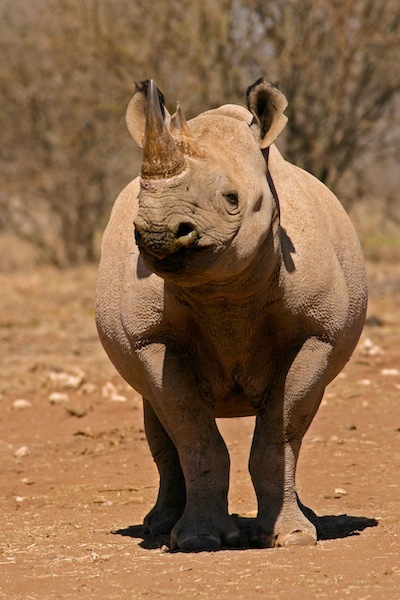 Black rhinos are hairless, with the exception of small tufts behind its ears, on its tail, and its eyelashes. Males are generally larger than females of the species. This species has two horns, one anterior and one posterior to its mouth. The rhino’s horns are made up of keratin compounds, not unlike human hair and nails. Male and female rhino’s horns are very unique, white rhinos usually are thick and harder, while black rhino’s horns are generally narrow and sharp. Different subspecies display separate horn development as well. Some black rhinos are also known to grow a third small horn in between the anterior and posterior horns. The anterior horns can be as large as 1.5 meters, and are the prize that has made them the target of poachers. The most obvious distinguishing feature that separates the white rhino from the black is the black rhino’s pointed lip. The hump on the back of the black rhinos’ neck is also pronouncedly smaller than the white rhino. Size, ears, feet, and heads are different in the black rhinos’ features, than that of their larger counterparts. The black rhino has been observed in several places across eastern and southern Africa, especially Tanzania, Kenya, Cameroon, Zimbabwe, Namibia, Angola, and South Africa. However, they may have once roamed across all of Africa, with the exception of the Congo. 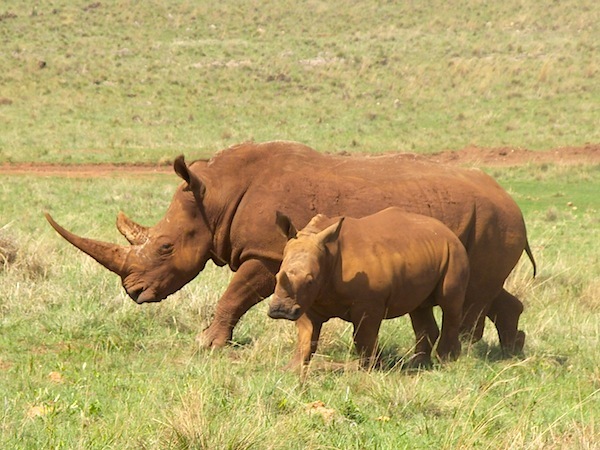 Today, most black rhinos exist only in wildlife preserves and conservation reservations. Their population, even in these secluded and protected areas, continues to dwindle rapidly. Male black rhinos are territorial creatures, maintaining a large home area. Most other lesser males will accept territorial boundaries, however when two black rhino males meet, it can escalate to violence quickly. They use their horns, while snuffling and growling, to charge at one another until one of them is wounded or flees. These fights can sometime result in the death of one of the males. Females are often left to freely wander in and out of the male’s territory. The male remains solitary until mating season. The males mark their territories with urine and dung they have scraped onto their feet, and track the scent over the bounds of his turf. A herd of rhinos, or “crash”, was observed, as large as fifteen members, but the interactions were only temporary. Black rhinos also observe a “community latrine” ritual, where many of them eliminate in the same area, to express where they have been. Like most other rhinoceroses, the black rhino must create a wallow of mud during midday, or suffer heat exhaustion. When near a communal watering hole, or wallow, black rhinos seem to become much more social with others of its species. They may also cooperate near salt licks. Black rhinos are one of the more vocal breeds of rhino, and are known to communicate in grunts, whistles, and snorts. Snorting is generally a sign of the rhino being disturbed or angry, while grunts are common when dealing with large groups. While skittish of alarming things at first, a black rhino is curious and will sometimes return charging if it runs at first. Observers of the black rhino are encouraged to leave if they have startled the creature, as a charge can be dangerous. The black rhinos’ feeding habits are more akin to its Asiatic cousins, a browsing eater. They are known to eat twigs, brush, leaves, fruits, and other low lying foliage. They are known to ingest up to 25 kilograms of this plant matter daily. They use their prehensile pointed lip to grab and guide saplings and bushes into their mouths. From there, the black rhino uses its teeth and cheeks to break the matter down. They also have been known to use their horns to knock down trees to reach higher branches, and to scrape bark off of healthy trees. Young black rhinos are grazers, meaning they feed almost exclusively on grass. Black rhinos browse for food most of the day, only stopping to wallow or sleep when the sun is at its peak. They can survive few days without water, but when near a watering hole, will drink as often as twice a day. The female black rhino reaches sexual maturity in five to seven years, and will generally have a calf as soon as she reaches that age. The gestation period is about fifteen months long, after which the new mother gives birth to a single calf. The calf is usually weaned after a year, but may stay with the mother as long as four years, around the time the female is ready to mate again. The mating rituals of the black rhinoceros are very similar to white rhinos’. A male blocks the female from leaving his territory when it senses a female who is ready to mate. The female rhino will attempt to escape until it feels comfortable with the male. The female rhino then seeks a solitary place to give birth.